Tokyo International Exchange College Ikebukuro is located in Ikebukuro, the popular city with young people. We are located in Ikebukuro area, which is one of the biggest cities in Tokyo. Our school is located in big city, but our school is in a quiet residential area. It is very good environment for students to study. It is easy to access major public transportation. ▸Access from Tokyo International Airport (Haneda Airport): About 50 minutes by Keikyu Line and Yamanote Line. ▸Access from Narita Airport: About 55 minutes by Keisei Skyliner and Yamanote Line. ▸Access from JR Tokyo Station: About 25 minutes by Yamanote Line. ▸Access from Shinjuku Station: About 15 minutes by Yamanote Line. 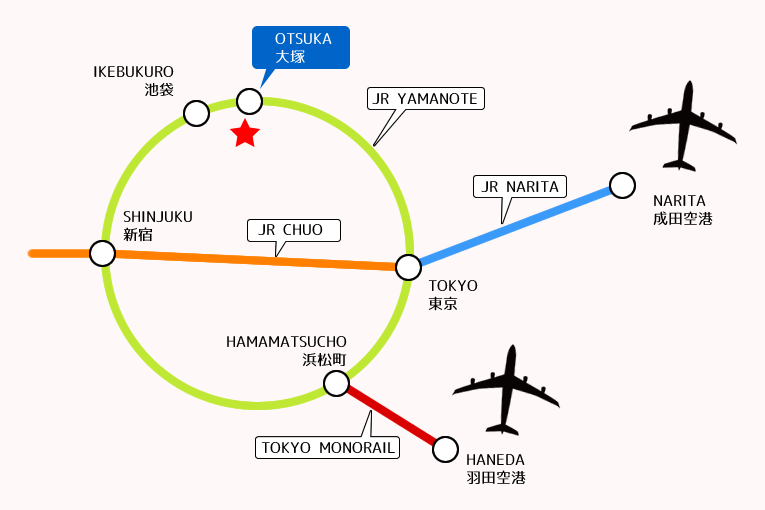 This is how to get to Tokyo International Exchange College Ikebukuro from JR Otsuka station.